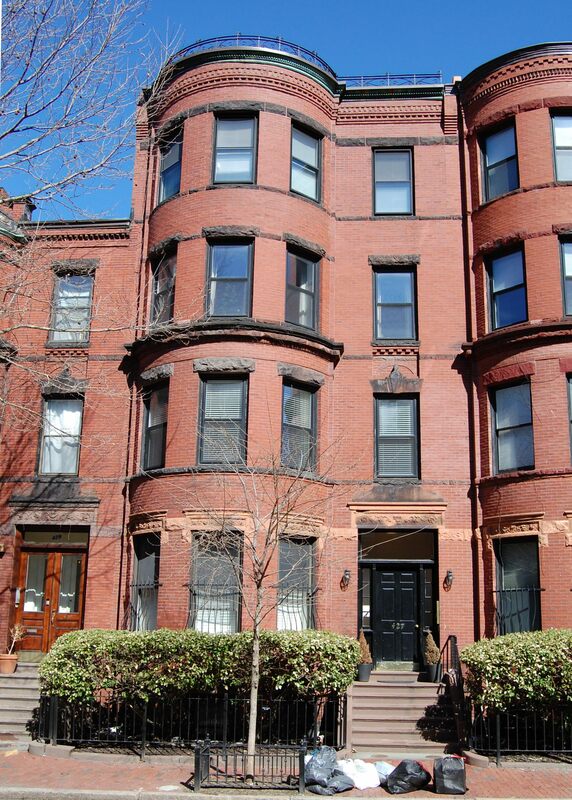 427 Marlborough is located on the north side of Marlborough, between Massachusetts Avenue and Charlesgate East, with 425 Marlborough to the east and 429 Marlborough to the west. 427 Marlborough was designed by architect Obed F. Smith and built in 1886-1887 by Charles A. Dodge, mason and builder, one of three contiguous houses (425-427-429 Marlborough) built for building contractor George Wheatland, Jr., for speculative sale. He is shown as the owner on the original building permit applications for all three houses, all dated October 14, 1886. 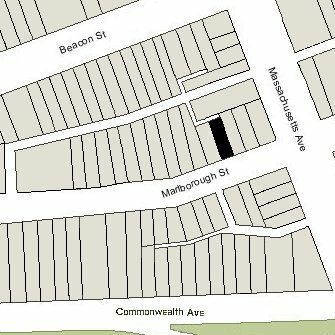 Click here for an index to the deeds for 427 Marlborough, and click here for further information on the land west of Massachusetts Avenue between the south side of Beacon and the north side of Commonwealth. On November 1, 1887, 427 Marlborough was purchased from George Wheatland, Jr., by retail men’s clothier David W. Noyes. He and his wife, Harriet D. (Riley) Noyes, made it their home. They previously had lived at 8 Greenwich Park. 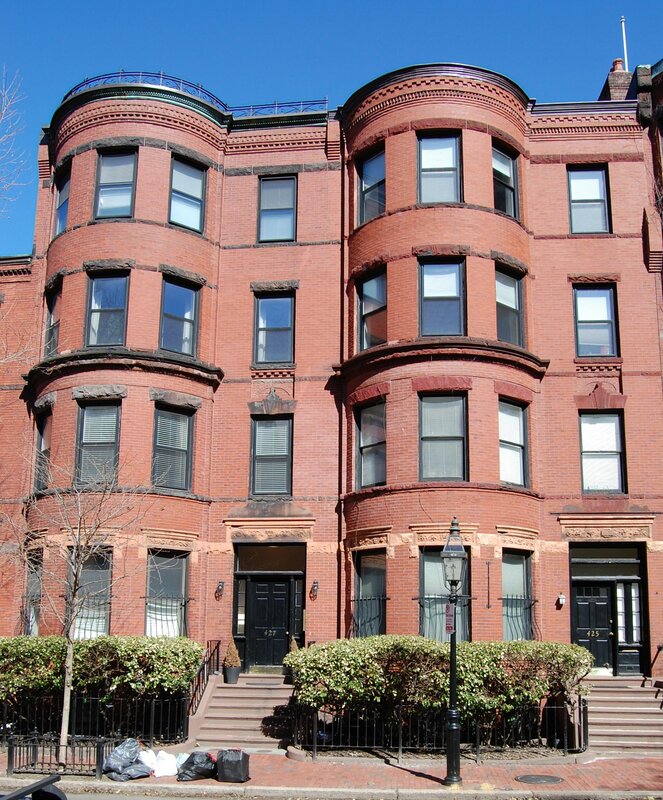 They continued to live at 427 Marlborough during the 1907-1908 winter season, but moved thereafter to Brookline. On August 10, 1908, 427 Marlborough was purchased from David Noyes by Maude Lillian (Gates) Everett, the wife of Dr. Eugene Ellsworth Everett. They previously had lived at 138 Huntington. Eugene Everett was a physician and also maintained his office at 427 Marlborough. He also leased office space to other doctors. The Everetts continued to live at 427 Marlborough until about 1928, when they moved to Westwood. He continued to maintain his office at 427 Marlborough and converted the remainder of the house into a lodging house. On July 16, 1929, Maude Everett transferred the property into her and her husband’s names. At about the same time, 425 Marlborough, which had been a lodging house for nurses, changed hands. 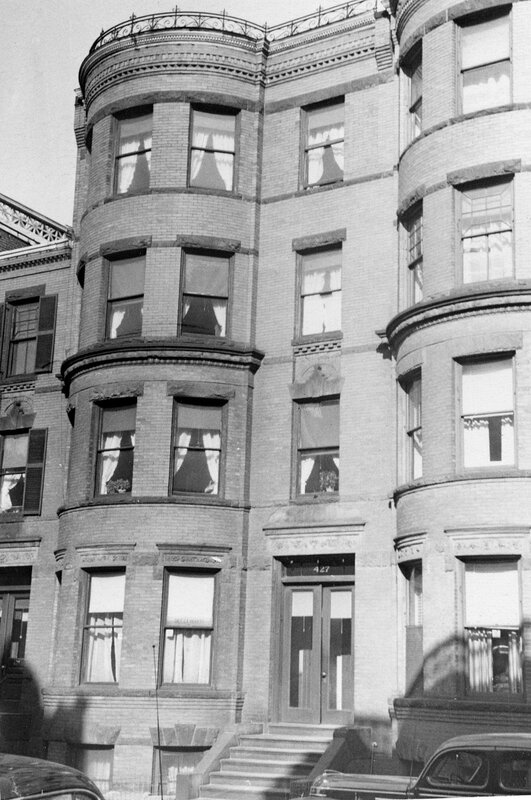 Miss Helen Goodell Medbury, who operated the lodging house, and a number of the residents moved to 427 Marlborough. Helen Medbury continued to live at 427 Marlborough and operate a lodging house for nurses until about 1953. Eugene Everett continued to maintain his office there until about the same time. On May 15, 1953, 427 Marlborough was purchased from Eugene Everett by Albert Leo Hollingdale and his wife, Margaret E. (Tabor) Hollingdale. Earlier that month, they had acquired 425 Marlborough. They operated lodging houses at both addresses. The Hollingdales lived at 82 Bay State Road. They also owned 517 and 519 Beacon, which they operated as lodging houses.